The picturesque pilgrimage in the hinter lands of the Himalayas is the most sacred spot where Ganges, the stream of life, touched earth for the first time. 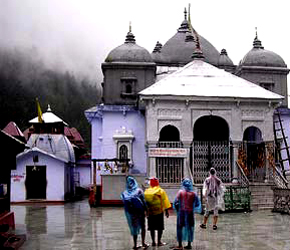 Gangotri is the second stopover for the Char Dham Yatra. According to mythology, Goddess Ganga - the daughter of heaven, menifested herself in the form of a river to absolve the sins of King Bhagirath's predecessors, following the severe penance of several centuries, Lord Shiva received Ganga into his matted locks to minimise the immense impact of her fall. She came to be called Bhagirathi at her legendary source. Along the right bank of Bhagirathi stands the shrine of Gangotri dedicated to the Goddess. preched at the height of 3140 mts.. It was constructed in early 18th century by a Gorkha Commander, Amar Singh Thappa. Every year, lakhs of pilgrims throng the sacred temple between April and November. By the November end, Gangotri is covered by snow. It is believed that the Goddess retreats to Mukhba, her winter abode (12 km. down stream). The physical source of the holy river is at Gaumukh, 19 kms. 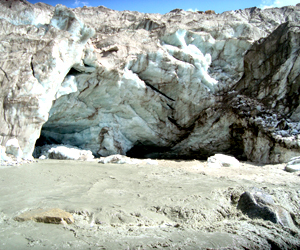 further uphill, along the Gangotri Glacier. Several pilgrims trek upto the source to offer prayers either on foot or on ponies. The verdant valleys, dense forests and towering peaks offer excellent trekking and mountaineering opportunities for adventure enthusiats. The 18th century temple dedicated to Goddess Ganga is located near a sacred stone where king Bhagirath worshipped Lord Shiva. Ganga is believed to have touched earth at this spot. According to another legend, Pandavas performed the great Deva Yagna here to atone the deaths of their kinsmen in the epic battle of Mahabharata. The temple is an exquisite 20 ft. high structure made of white granite. The natural rock Shivling, submerged in the river, is an amazing sight reinforcing the power of the divine. According to mythology, Lord Shiva sat at this spot to receive the Ganga in his matted locks. 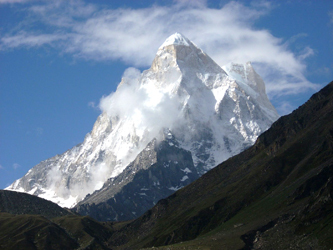 The Shivling is visible in early winter when the water level goes down. An arduous, 25 kms long trek along the Gangotri Glacier leads to scenic Nandanvan - the base camp of Bhagirathi peaks, that offers a panoramic view of the surrounding Shivaling peak. A trek across the snout of the Gangotri Glacier leads to Tapovan known for its beautiful meadows the encircle that base of the Shivling peak. Jolly Grant, Dehradun 266 kms.